TV sets used to be fat, cube shaped boxes with room for a fairly good speaker but today are flat and wide with less and less room for speakers as the TV displays get thinner. This means the flat screen's built-in TV speaker is not the best at producing quality audio. One solution to the less than stellar sound from TV speakers today is the soundbar. These wide, elongated speaker systems often match your TV style and lessen the wiring around your room for surround sound speakers. Soundbars are available with all kinds of features and options. They can cost more than your TV. Soundbars often come with a remote control and many can be mounted on a wall. Most soundbars contain multiple speakers and some models come with a subwoofer, often wireless, for really boosting your audio enjoyment. A good sound bar will have a front panel display so you can see which input you are on and what the volume level is set to and other status indicators. Don't expect a soundbar to give you the audio quality of a full surround setup (audio/video receiver plus six full-sized loudspeakers) because full surround systems have higher quality loudspeakers and better electronics and connections. 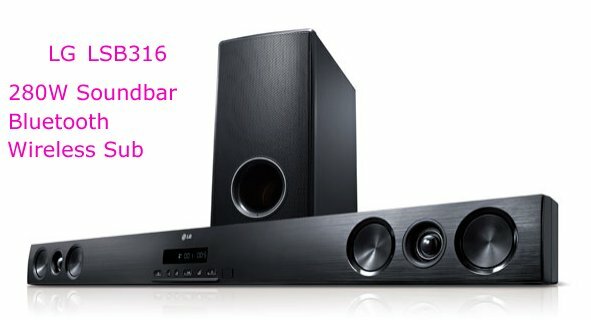 The soundbar can produce what is known as Virtual Surround Sound which can be quite good but not as good as a full surround system. The benefit of a soundbar is that you get better sound than from the TV speakers without the more complex wiring and space requirements of a home theater setup. The soundbar you choose should have all the inputs you may want to use, including HDMI, optical, analog RCA, coaxial digital audio, USB and ideally, multiple inputs for each. Soundbar Height: 3" Width: 37-3/8" Depth: 1-5/8"
Bluetooth - stream music from your Smartphone. Stylish, low profile sound system for your TV and smart devices. Q: Can I use my TV as a switch? 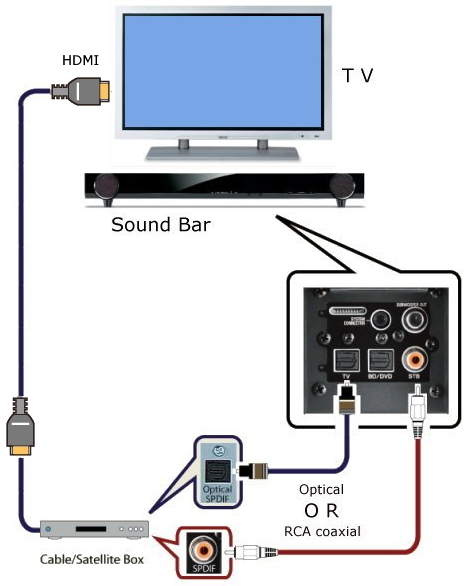 So hookup everything to the TV; PS3, cable box, Blu-ray player and run an optical audio cable from TV audio output to the soundbar input? A: Yes, but only if your TV supports this. Some TVs may only allow the built-in tuner audio to be sent out and not other HDMI inputs. Q: I have a soundbar with HDMI input. 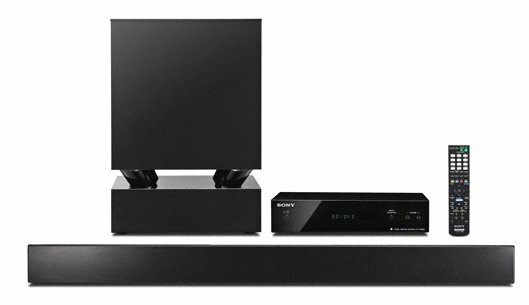 If I connect a Bluray player with built-in decoding using HDMI to the soundbar, will I get surround sound? A: Soundbar systems do not have the left surround or right surround speakers located around the listener. So although they come close, by definition a soundbar setup cannot provide the 6 channel effect even if provided the input. At best you could get 4 of the typical 6 surround sound audio streams available.